EVANSTON, Ill. (AP) — Although Northwestern limped to the finish line on Wednesday night, coach Chris Collins preferred to focus on the positive. “I’m gonna look more at the first 25 minutes of the game when we were fresh,” Collins said. “I thought our defense was really good. I thought we were connected. I thought we played with great energy and we were cutting well. Collins is so forgiving because he understands what his team has been through of late. The Wildcats played three games in four days over the weekend in the Wooden Classic in California and then couldn’t travel home Sunday night because of a winter storm. The team arrived on campus at 8 o’clock on Monday night. Gaines hit a 3-pointer at the buzzer to make it 40-20 at halftime, NU’s biggest lead to that point. The lead was down to 57-47 with 7 ½ minutes to play. Georgia Tech kept chipping away, but couldn’t score consistently enough to make a serious push at winning the game. 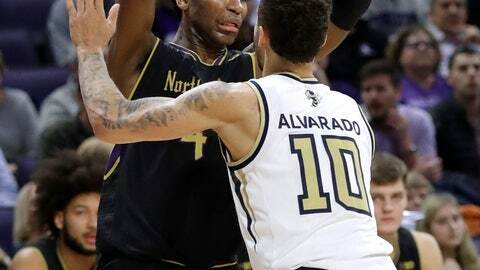 The closest the Yellow Jackets got was 66-61 on an Alvarado 3-pointer with 1.4 seconds to go. Georgia Tech: All of the Yellow Jackets’ wins so far this season have come against teams from smaller conferences. Their only other road game was a 66-53 loss against No. 6 Tennessee. Northwestern: Despite playing three games in four days, the Wildcats had plenty of energy early, particularly on the defense end. Collins has said repeatedly that this team’s success will be determined on the defensive end. It certainly was Wednesday. They’ve got good chemistry,” Pastner said of Northwestern. “I’m a huge fan of Coach Collins. They run good stuff. They do a really good job defensively. Northwestern doesn’t have much of a chance to catch its breath. Wednesday’s game began a stretch of three games in seven days, including a pair of Big Ten games against Indiana and Michigan. Georgia Tech: Play St. John’s in the Hoophall Miami Invitational on Saturday.